Student subjects Jamison Ly and Milad Ebadat take part in a Department of Kinesiology study into whether virtual reality games can help promote exercise. In the first study of its kind in the U.S., San Francisco State University’s Department of Kinesiology has taken the initial steps in establishing itself as a pioneer in the research of augmented exercise, which uses virtual reality games as part of a regular workout routine to promote physical fitness. Since January, a team of researchers led by Professor Marialice Kern has been studying the metabolic energy expended while playing VR games. During the initial study, SF State graduate student Dulce Gomez led a team of undergraduate researchers and collected heart rate and oxygen consumption (which was then converted to energy expenditure data) from more than 40 subjects during the spring semester. Subjects performed activities such as boxing in a virtual ring (13-18 calories per minute), and played other games that included using a bow and arrow on an archery course or dodging colorful orbs to a musical beat (four to six calories/minute). The team also collected metabolic data on a number of the most popular VR titles on the market. The observed heart rate and oxygen consumption levels suggest that the hundreds of thousands of gamers already playing in VR are likely moving enough to qualify as exercising at least part of the time. The research forms the foundation of Gomez’s master’s thesis, which she hopes to publish this fall. 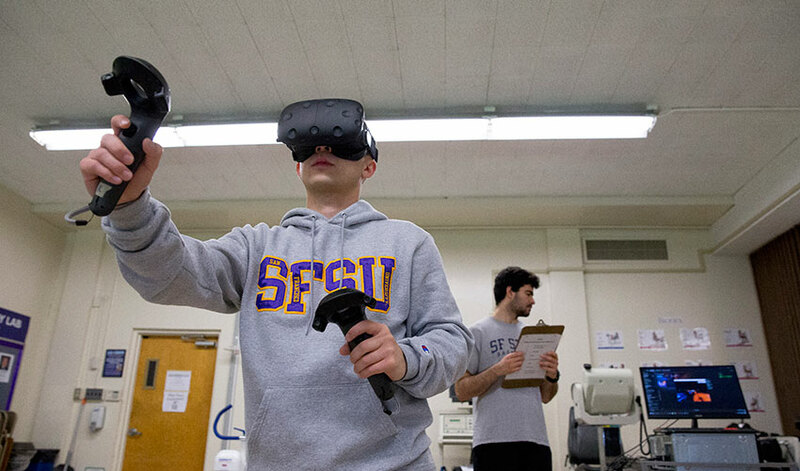 And, in an additional step to help consumers better understand which games may have higher energy expenditures, SF State is collaborating with the newly established VR Institute of Health and Exercise. The Institute, founded and directed by Silicon Valley entrepreneur Aaron Stanton, is an independent industry group that collects ongoing metabolic observations to create VR exercise ratings. The ratings will be published online by the VR Institute to help gamers find content based on their metabolic equivalent to typical real-world exercises, like running or biking. The Institute rates games into one of eight categories. Games can qualify as the metabolic equivalent (MET) of resting, walking, elliptical, tennis, rowing, biking, swimming, or sprinting. These ratings correspond to the industry standard of MET ratings equal to each activity. According to Steamspy.com, which tracks game usage on the popular game platform Steam, gamers have spent more than 18 million hours combined playing VR in the last two years. SF State and Stanton will continue to gather data on more games using more equipment during the upcoming academic year. Researchers will look specifically at why some people experience motion sickness while playing virtual reality games.